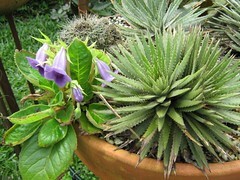 Dyckia´s companion. Cactus and sinningia speciosa ( a southern variety). They do good altogether and I think this fits good and it is nice for the eyes.